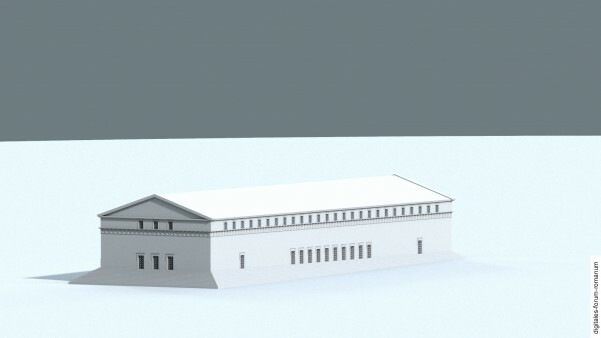 Because it is so poorly preserved, the Basilica Iulia has been widely ignored; yet it was the most monumental basilica on the Forum Romanum in the late Republic. 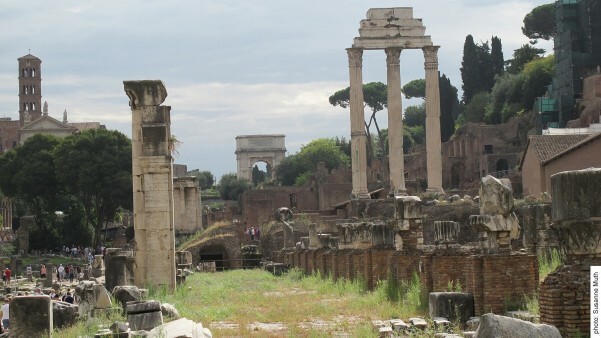 It was erected under Caesar / Augustus on the south side of the Forum as the successor structure to the Basilica Sempronia, which Tiberius Sempronius Gracchus built in 169 B.C. near the former atrium houses south of the tabernae veteres. 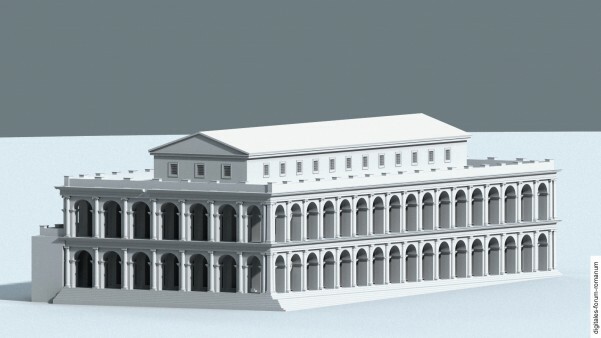 The extraordinary scale of the Basilica Iulia can be traced back to its various functions (including its role as an ostentatious dedication): it was the location of the centumviri, a court that was initially composed of 100 men; and literary sources report that up to 4 trials would take place here simultaneously. In addition, the Basilica Iulia also housed the “coin checkers” (lat. nummularius). The Basilica Sempronia was initially built on the south side of the Forum at the behest of the censor Tiberius Sempronius Gracchus in 170/169 B.C., no more than 10 years after the construction of the Basilica Fulvia on the north side. 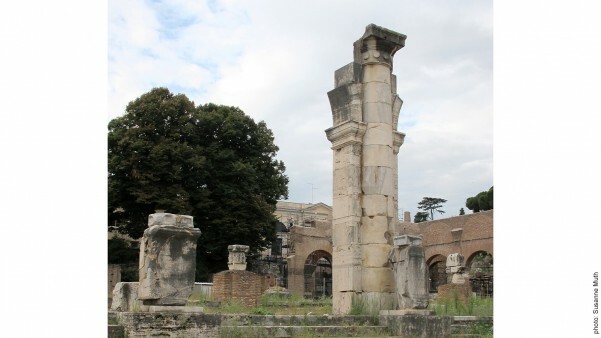 The historian Livy reports that Gracchus erected the basilica at public expense at the former location of the atrium house of the famous general P. Cornelius Scipio Africanus. This atrium house was torn down, just like the adjoining ones. 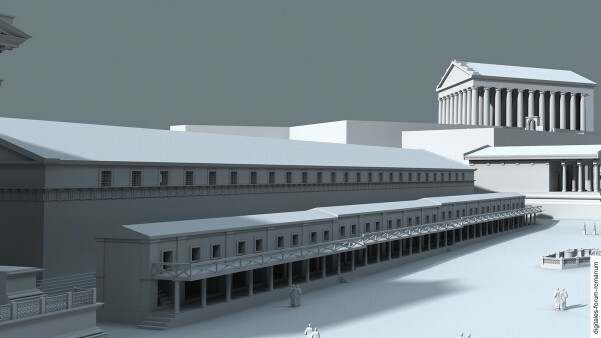 The demolition of the old Basilica Sempronia and the initial construction of the new Basilica Iulia, which Caesar financed with his spoils from the Gallic wars, presumably took place in 54 B.C. 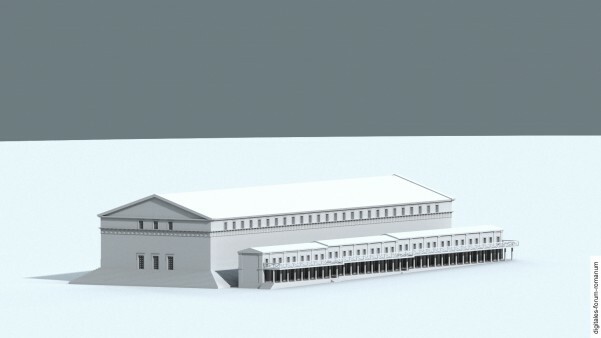 At this time Caesar made numerous modifications to the north part of the Forum, such as relocating the Republican rostra to the west side of the Forum, rebuilding the Basilica Paulli, and relocating the Curia Hostilia – which from that time on was called the Curia Iulia and faced the Forum Iulium (also built by Caesar). Thus Caesar initialised fundamental changes to the Forum’s appearance (see Caesarian epoch). Caesar inaugurated the Basilica Iulia, still unfinished, in 46 B.C. As with the Rostra Caesaris / Augusti or the Curia Iulia, the Basilica Iulia was brought to completion under Caesar’s successor, Augustus. 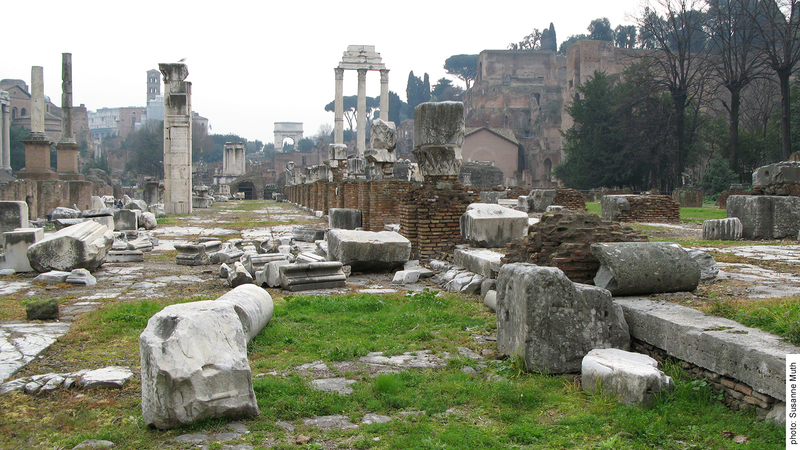 But the basilica had to be rebuilt just a little later, after a fire devastated the Forum in 12 or 9 B.C. The designated heirs of Augustus, his two adoptive sons Caius and Lucius Caesar, were presented as the financial benefactors of the reconstruction. A porticus in front of the Basilica Paulli just opposite (the so-called Porticus Cai et Luci) had already been built in their names. However, both adoptive sons died before the basilica was completed. In commemoration of them, the basilica was named after them at its inauguration in 12 A.D. as the “Basilica Cai et Luci”. However, this name did not gain acceptance and it retained its old name, “Basilica Iulia”. 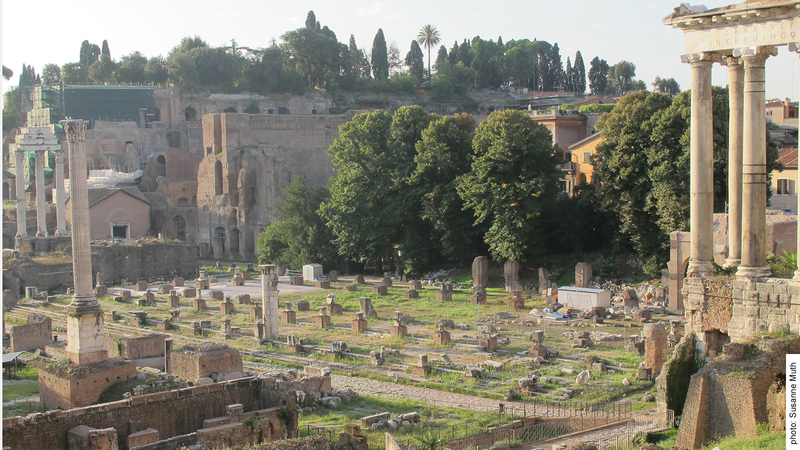 In 283 A.D., under the reign of Emperor Carinus, the basilica was once again destroyed by a devastating fire that raged on the west side of the Forum. 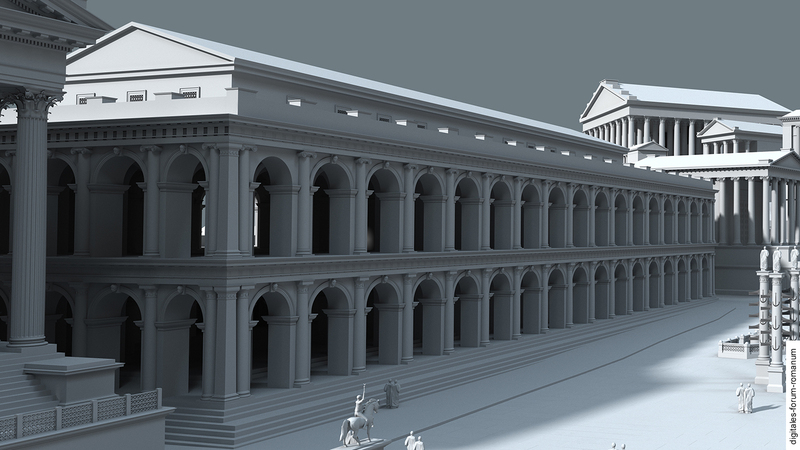 Shortly thereafter it was rebuilt again by Emperor Diocletian. 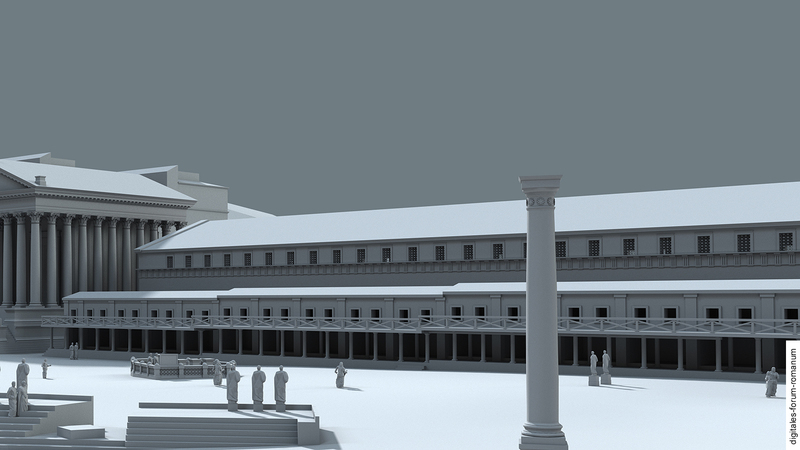 This reconstruction was accompanied by numerous other changes to the Forum in Late Antiquity, also affecting the Basilica Paulli and the Curia on the opposite side (see Tetrarchic epoch). In the course of the 4th and 5th century A.D., the basilica was decorated with a large number of statues brought from other locations in Rome and erected in front of the outer pillars (for the individual phases, see below). Several brick walls from the north-west part of the building survive to this day, presumably originating from the restoration phase under Diocletian. This seems plausible because the church S. Maria in Cannapara was built into the basilica during the 7th or 8th century A.D., thereby making use of the west part of the basilica. The remaining parts of the building were possibly used as a quarry, the construction material it yielded being gradually built into other structures. Because the basilica’s structure was modified in the medieval period and used as a church, the once monumental five-aisle basilica has only survived fragmentarily. In addition, the area in which the Basilica Iulia stood was one of the first areas of the Forum to be excavated in the 18th century; and unfortunately, the scholarly documentation of excavations was not a primary concern at that time. During the 19th century some of the pillars of the basilica were re-erected and architectural finds from the area were placed on top of them, meant to appeal to educated travellers. This construction can still be seen today. The systematic reconstruction of the building and its construction phases is therefore impeded by the damages from its medieval reuse and the early excavations and restoration measures in the 18th and 19th century (for images of the present-day ruin, see below). The Basilica Iulia stretches along the south side of the Forum Romanum between the Temple of Saturn and the Temple of the Dioscuri. On its west side it is bordered by the vicus Iugarius and on its east side by the vicus Tuscus. 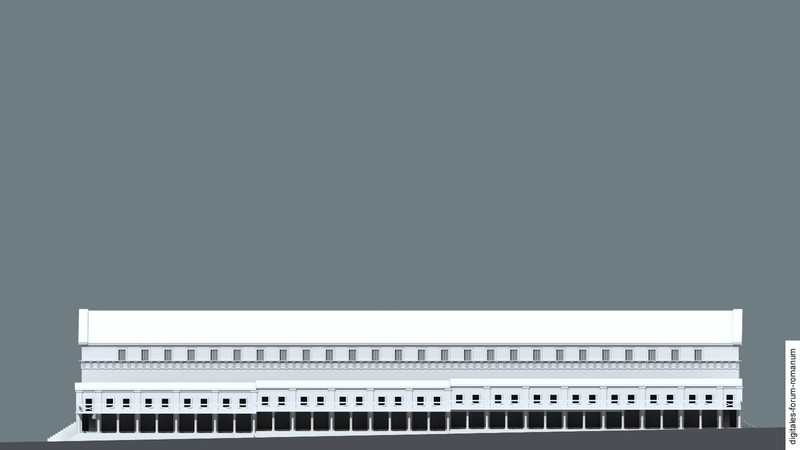 The former monumentality of the building with five aisles – including a three-storey middle aisle and two-storey side aisles – is now attested only by the big podium and the immense ground plan of 101 m x 49 m. Located at the east, north and west sides are several sets of stairs that differ in height, each adapted to the rising terrain: the basilica was accessed on the east side by 7 steps, whereas entering from the west side required only 1 step. Numerous markings (e.g., games) were carved into these marble steps. The basilica was a multifunctional building. Ancient writers remark on multiple occasions that the basilica was home to the tribunal of the centumviri (“court of the 100 men”). Scholars take this as strong evidence that basilicae generally housed judicial trials. Pliny even describes an trial at which 180 judges were present, while the galleries above the side aisles were packed with countless spectators. During the excavations in the 1960s an impluvium (pool in the atrium of a Roman house) was discovered beneath the east end of the middle aisle of the basilica. This corroborates the literary evidence, which reports that the Basilica Sempronia was erected on top of older atrium houses. 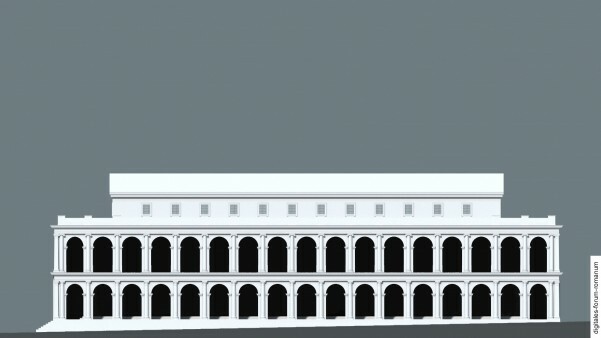 The Augustan historian Livy tells us that the Basilica Sempronia was erected behind the Tabernae veteres – similar to the Basilica Paulli on the north side with the Tabernae novae in front of it. 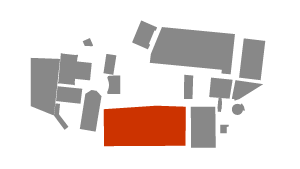 Only very little of the foundations of the original Basilica of Sempronius Gracchus has survived and this renders a reconstruction of its ground plan next to impossible. Only two parallel foundation walls that can be ascribed to the building allow us to conjecture that the intercolumniation (the distance between two columns) was about 5,45 m. This assumes that these foundations determined the positions of the pillars. The difference in height from the ground between the Sempronian and the subsequent Caesarian phase was about 30 cm. This can be inferred from the observation that the marble floor of the Caesarian basilica was placed directly upon the travertine floor of the earlier structure. The Basilica Iulia was commissioned in 54 B.C. by Caesar and inaugurated in 46 B.C., although it was still unfinished. It was later completed by Caesar’s adoptive son, Emperor Augustus. Except for the capital of a pilaster, no architectural remains can be securely attributed to this phase and this strongly hinders the reconstruction process. We know from a statement made by Augustus in his funerary inscription (Res Gestae Divi Augusti) that the later building was to be erected on an area bigger than that of Caesar’s preceding structure. Thus it seems safe to assume that the basic outline of the basilica already included five aisles, but that it was realised on a smaller scale. 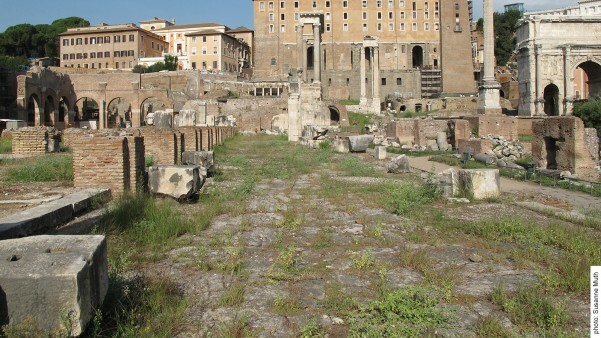 During its reconstruction under Caesar, the Tabernae veteres, which had separated the former Basilica Sempronia from the Forum on its north side, were also torn down. 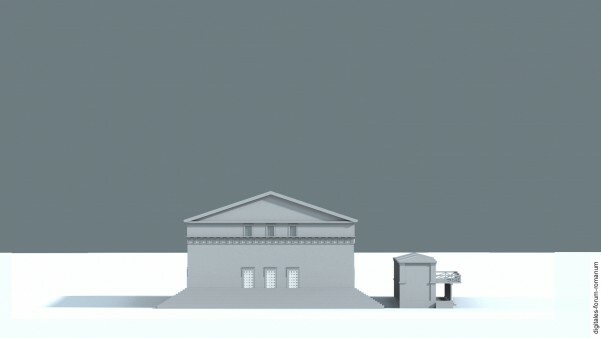 Thus the basilica and its facade moved right to the edge of the Forum – similar to the Basilica Paulli. At least during the Augustan phase, the northern part of the basilica was separated from the southern part by three steps. On the one hand, this might be explainable in terms of the terrain sloping from south to north. On the other hand, it is commonly assumed that this area constitutes the original location of the Tabernae veteres. Furthermore, not only is this area clearly separated from the rest of the basilica by three steps, but the distance between the pillars is bigger than that in the southern part of the basilica. Thus it is plausible that this structure was supposed to take on the function of the Tabernae that it had been built atop. At the south side of the building more new Tabernae were constructed (now largely buried). Because their walls were built of monumental ashlar blocks in travertine, it has been conjectured that these are pre-Augustan and thus might originate from the Caesarian construction phase. 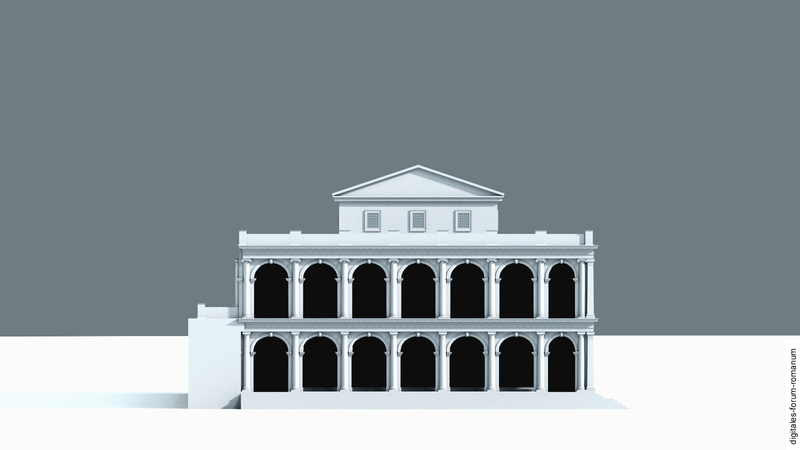 In contrast to the preceding phases in which the building’s appearance is difficult to verify and reconstruct, the construction phase under Augustus can be investigated on the basis of fairly solid evidence. The Augustan structure was built after the fire in either 12 or 9 B.C., when the Caesarian Basilica Iulia burnt to the ground. This monumental new construction occupied an area of 107 m x 51 m. The middle aisle alone was 75 m x 16 m and ornamented with a spectacular floor made of coloured marble slabs. It was surrounded on all four sides by a pair of pillars, producing the five aisles of the basilica. Today one of the pillars of the former northern facade has been re-erected with a plain Tuscan column. Above it towered a second composite order, making for an impressive exterior facade. Several pillars of the building were arranged in the shape of a cross and were connected by arches which formed arcades. They were composed of an opus caementicium core faced with bricks and marble. 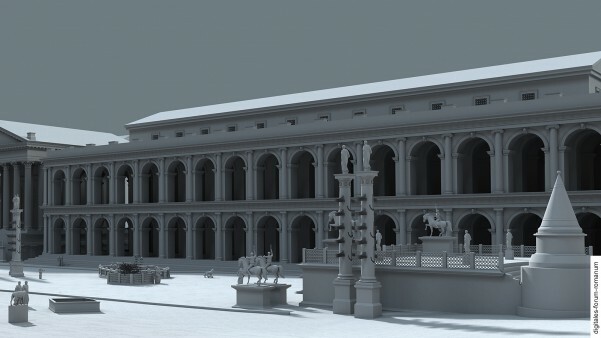 The overall reconstruction of the early Imperial building phase of the Basilica Iulia is complicated by the fact that a large portion of the material findings belong to the Diocletian restoration in the later 3rd century A.D. Heated discussions have arisen about various architectural features, e.g., whether the arcades of the Basilica Iulia were built under Augustus or first introduced in Late Antiquity. Fortunately, the fragments of the Severan Marble Plan of Rome (Forma Urbis Romae) depict the Basilica Iulia and can be dated to the transition from the 2nd to the 3rd century A.D. Here the Basilica Iulia is shown with five aisles (Augustan phase), so that it may be assumed that the Diocletian construction was relatively faithful to the layout of the Augustan basilica with the Tabernae adjoining it on the south side. 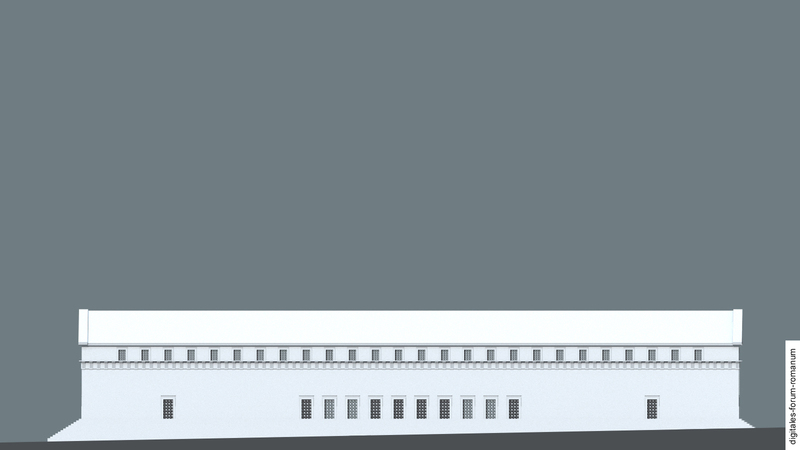 Because of the monumental scale of the building, the installation of pillars was structurally necessary. This kind of support can also be found in the Basilica Paulli, which stood on the opposite side of the Forum and also had a porticus (from the Augustan period) lined by arcades. In 283 A.D., under the reign of Emperor Carinus, the basilica was yet again heavily damaged by a fire. Today the only arcades still standing in the west part of the basilica attest to the restoration process. These arcades managed to survive because a church was built into this area in the 7th or 8th century A.D., whereas the rest of the building was successively dismantled and the individual elements then integrated into other structures. When the basilica was reconstructed under Diocletian, the walls and pillars were repaired or entirely rebuilt with bricks; this allows us to date them precisely, thanks to the brick stamp. 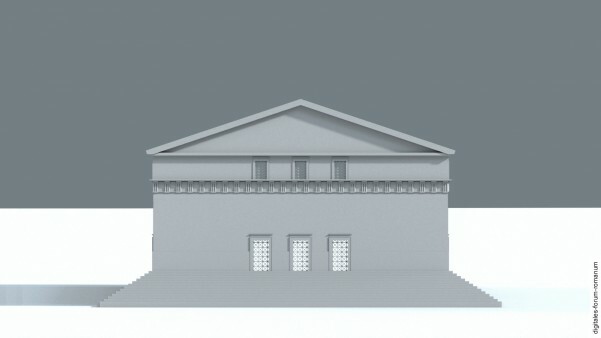 It is safe to assume that the scale and appearance of the Augustan phase was preserved (see above). 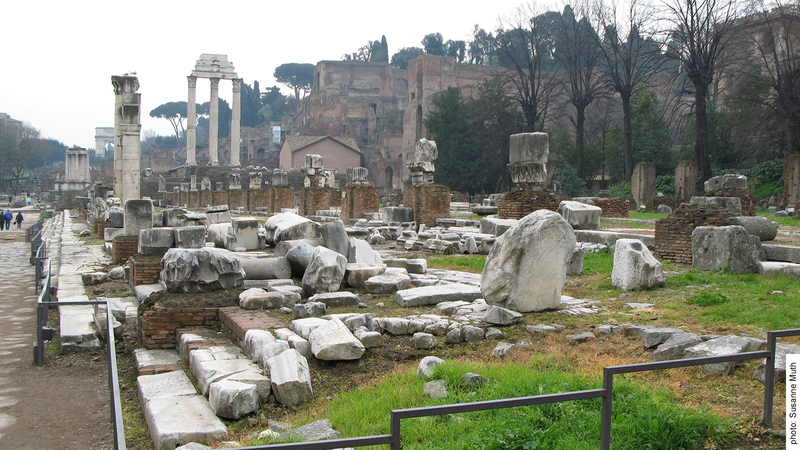 During the 4th and 5th century A.D. the basilica continued to be an attractive place for consecrations and statues. For example, older statues that were brought here from other places in Rome were displayed in front of the exterior pillars. The bases of theses statues were old altars whose inscriptions were erased and replaced with new ones naming the benefactors. C. F. Giuliani – P. Verduchi, Basilica Iulia, in: E.M. Steinby (ed. ), Lexicon Topographicum Urbis Romae I (Rom 1993) 177–179. Ch. 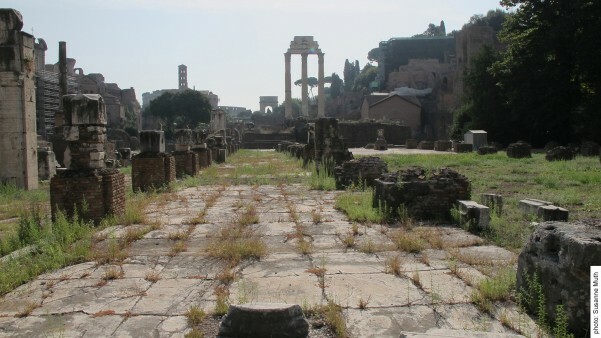 Hülsen, Das Forum Romanum. Seine Geschichte und seine Denkmäler (Rome 1904). I. Iacopi, Basilica Sempronia, in: E.M. Steinby (ed. ), Lexicon Topographicum Urbis Romae I (Rom 1993) 187-188.